Published Dec 2, 2014 by Peachpit Press. Part of the Learn by Video series. Expressing your unique voice and vision is a passion for most artists, and you don’t need tools getting in the way. 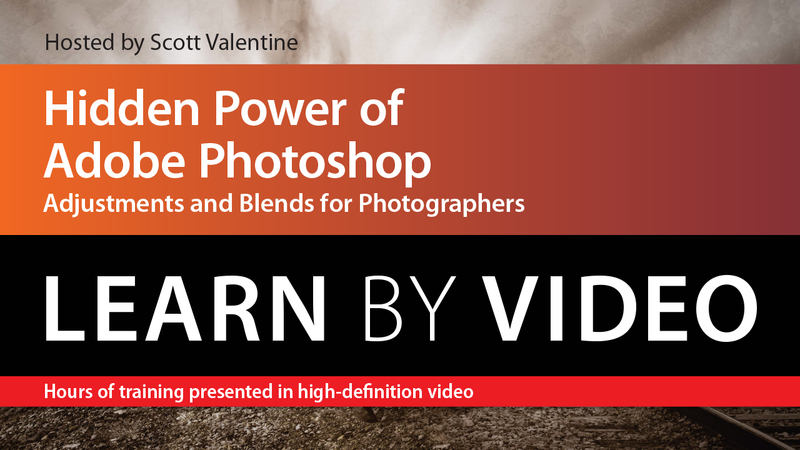 Scott Valentine helps you gain expert control over two of Photoshop’s essential editing tools: adjustment layers and blend modes. They can be easy to use, but they aren’t always easy to understand. Scott translates the technical elements into every day language and demonstrates techniques using real-world examples. Whether you’re a professional or hobbyist, there’s something here for you. The video starts with a demonstration of the fundamentals of the tools so that you have a deep understanding of how they work. You’ll also learn multiple ways to approach important photo-editing techniques, including black and white conversion, color correction, detail enhancement, and dodging and burning. The Hidden Power of Adobe Photoshop Adjustments and Blends: Learn by Video will help you gain effortless control so you can stop thinking about your tools and get back to thinking about your art. The video is wrapped in a unique interface that allows you to jump to any topic and also bookmark individual sections for later review. The unique “Watch and Work” mode shrinks the video into a small window to allow you to work alongside in Photoshop as you view the video. Project files used in the lessons are included on the disc so you can practice what you’ve learned. At the end of every lesson, you can test your knowledge by taking interactive quizzes.